Emergencies happen. Plumbing problems, appliances break down, water heaters fail to heat, and air conditioners don’t cool. Village Plumbing & Home Services is there for you any time. 24/7. Call 713-526-1491 right now to set up your appointment, and by the way, if it can wait until Thursday, take advantage of our Thrifty Thursday offer! Besides our “$30 off any plumbing service” offer, visit this page often to stay in touch with our latest coupons, such as deals on insulation, a whole House Air Cleaner, the Water Heater Installation special, and more. Having Village in your corner year round is a great comfort to our current partners who enjoy Pre-Season Summer and Pre-Season Winter visits with a thorough checkup of your HVAC system. And join now to be receive one free visit on the Plumbing Partner plan too! Click to learn more or call 713-526-1491 to set this up for your home. We have a gallery/slideshow running on Facebook and on our Showroom Page, but it’s even better when you see it in person. It’s a brand new, 3,000 square foot SHOWPLACE filled with an unprecedented selection of kitchen and bathroom ideas, fixtures, accessories, sinks, toilets, tubs, showers and working displays all in one convenient location. Our domain name is VillagePlumbing.com, because plumbing IS our domain in Houston, and has been since we started in 1946. Other plumbers in Houston know this too, because we are called upon to supply them with the parts they need (not to mention advice on which parts they will need) to service the many types of kitchens and bathrooms that have been installed in the Houston area over the last many years. Yes, other plumbers rely heavily on Village, and you can too. Our Kitchen and Bath Showroom is an ideal place to start. Whether your Houston home was built in the 50s, or 70s, or in the 2000s, Village has experience with all the relevant plumbing parts and fixtures you’ll need. If you want to install a new sink, shower, or garbage disposal, call on the pros at Village for the best service and advice. Whatever your plumbing needs or problems, call Village now at 713-526-1491 for plumbing installations or repair items such as a clogged drain, repairing leaking pipes or faucets, or an overflowing toilet. 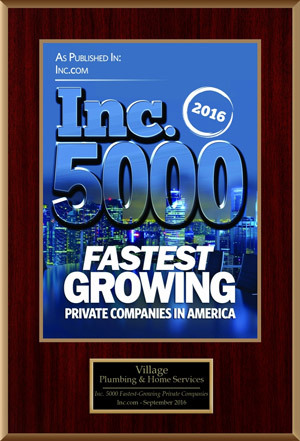 Village Plumbing & Home Services was named one of the Inc. 5000 Fastest Growing Private Companies in America, and is a Best of Home Advisor 2016 winner. Houston summers are hot and humid, but can be pleasant if you have a working air conditioner. In the event you need AC repair in Houston, call the experts at Village Plumbing and Home Services. We don’t want any of our customers waiting in a hot house, so we offer 24/7 emergency services. Our certified technicians will not only professionally service your cooling equipment, they will also leave their work area spotless. That’s why we’re known as the “cleanest techs in town!” Since 1946, we’ve been the leaders in Houston air conditioning services and we’re looking forward to making sure you’re cool and comfortable in your home. Give us a call when you need AC repair, maintenance, or installation services. Village Plumbing offers the best Houston cooling service in the area! We offer a comprehensive list of services, from routine maintenance and repair work to new system installations. We can also help you address air quality issues in your home and improve your energy efficiency too! A functioning air conditioner is essential during a Houston summer, and we can help make sure you don’t run into any surprises in the middle of a hot summer day. Air conditioning systems in Houston are prone to wear and tear, and it isn’t uncommon to experience some minor issues on occasion. The best way to prevent those from becoming major problems is to schedule a routine maintenance appointment today! How old is your AC? An air conditioner has a lifespan of around 10 years. However, it may not last that long depending on the original quality or how it was maintained over the years. If your AC is nearing 10 years old, it may not be worth it to spend a large amount on repairs if you have to replace it soon anyway. Is efficiency important to you? If your AC is older, it probably isn’t very efficient, which means higher utility bills for you. A new, high-efficiency AC could save you each month on your utility bills. Frequency of repairs. Is this the first issue you’ve had or do find yourself constantly calling for service? By upgrading your AC, you’ll not only be putting your money towards something that will last several years, but you’ll also have a more reliable cooling system. When we first opened our doors back in 1946, we were a family owned business and our guiding principles were simple. Be fair and honest with your customers, listen to their needs, and provide them the very best products and service. Things have changed over years. But our core values remain the same. As a woman owned business, we understand the importance of respecting you and your home. You want incomparable service and we deliver. We aim to leave your home in better condition than when we arrived. For over 67 years, Village Plumbing and Home Services is the only call thousands of Houston area homeowners have made for all of their plumbing, air conditioning, heating and appliance repairs. We look forward to hearing from you and putting our “Spotless” reputation on the line.